Here we have a dark fantasy anime which shows humanity’s struggles against man-eating giants known as Titans. This is Attack on Titan. Humanity is forced to live inside three walls known as Sina, Maria and Rose due to huge humanoid abominations that wander around outside known as Titans. The Titans eat humans, therefore making them the biggest threat to the entire human race. Eren Jaeger lives within Wall Sina when the Colossal and Armoured Titans appear and smash their way past the first wall. Due to that, humanity’s population rapidly declines, and Eren and his friends are forced to evacuate to within Wall Maria. Due to the attack by the Titans, Eren becomes determined to wipe out all Titans. The anime then follows his time as a trainee to his graduation and beyond. Eren Jaeger is the main protagonist of Attack on Titan. His determination to wipe out all the Titans is second-to-none, though his resolve wavers several time over the course of the series. As you might expect from a main character, Eren may just hold the key to defeating the Titans, though the reason for that is revealed roughly half-way through. Mikasa Ackerman is Eren’s adopted sister. She seems to be adept at all that she turns her hand to, and will not hesitate to charge into battle with the Titans. She is also committed to ensuring that Eren survives. Armin Arlert is a close friend of both Eren and Mikasa. He tends to get bullied, though he is fairly intelligent. Both he and Eren want to explore the world outside of the walls. There are loads of other character as well; too many to go over one by one. There are Eren’s fellow trainees, and then the anime introduces the members of the Survey Corps, followed by members of the Military Police. The soundtrack for Attack on Titan is fairly good. Both opening themes are suitably epic, and the ending themes are nice as well. Music played during the episodes fits the situations really well. So, what are the best parts of Attack on Titan? Well, the action scenes are always great to watch, of that I have no doubt. There are a diverse range of characters, so there will probably be at least one that you favour above the rest. Characters die all the time, as well. You may consider that a bad point, but it really demonstrates that humanity’s struggle against the Titans is not easy. Of course, there is no such thing as perfection, so what are the flaws? Well, since there are so many characters, there isn’t really too much focus on them as the anime continues. Sure, they may get a couple of lines later on, but not much else. The pacing is a bit off, as well. The anime skips two years near the start, and then tells the story in a mostly linear fashion. There is an exception, however; after a cliffhanger, an entire episode is a flashback, and the plot doesn’t pick up again until the episode after that one. Also, halfway through there is a recap episode. Though the episode is numbered 13.5, it could have just got on with the plot. Also, there are a few questions left unanswered by the time Attack on Titan ends, though as the manga is still ongoing, this could mean that there will be a second season. The highlight of Attack on Titan for me would be seeing the humans successfully take on the Titans. There’s just something really enjoyable about watching people overcome almost insurmountable odds, and with the 3D Maneuver Gear, they do it in style. An awesome action-packed anime that suffers some pacing problems. However, it is definitely worth watching. Oh, and I figure that it is worth mentioning that an Attack on Titan 3DS game is in the works. From what I can gather, it follows the plot of the manga and anime, with Eren, Mikasa and Armin being playable characters. The game is called Attack on Titan: The Last Wings of Mankind, and due out in Japan in December. Whether it will make its way over here to the UK I don’t know, but fingers crossed. 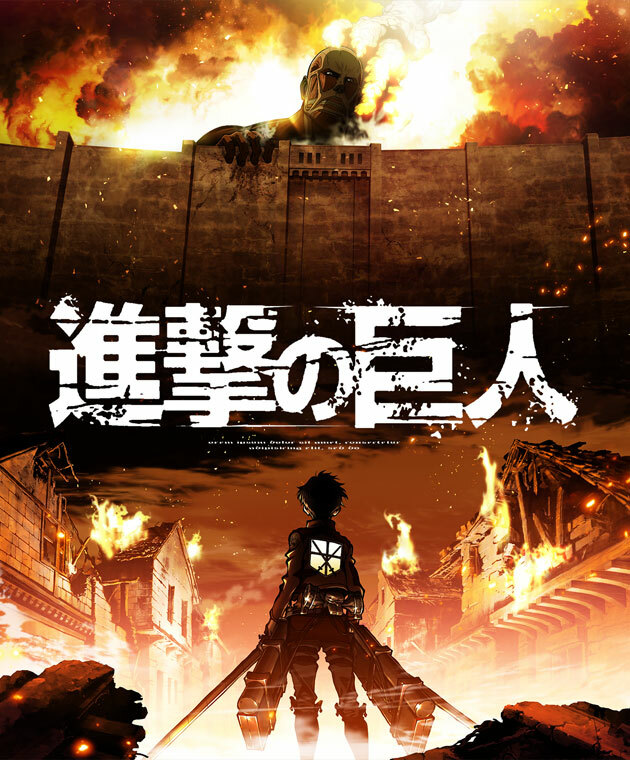 This entry was posted in Rory's Reviews and tagged Armin Arlert, Attack on Titan, Dark Fantasy, Eren Jaeger, Humans, Mikasa Ackerman, Rory's Reviews, Shingeki no Kyojin, Titans. Bookmark the permalink. Shingeki was quite an enjoyable watch, and having read the manga a while back I can say I was satisfied with how the anime adapted everything. Sadly, 25 episodes just barely scratches the surface and like you mentioned, quite a few of the characters didn’t get extensive development. Luckily that’s addressed a bit later on in the story and I’m definitely looking forward to seeing a season 2 for this to watch some of the later greatness in the series animated. At the London MCM Comic Con, Studio WIT had a panel where they talked about both Attack on Titan and Hal. The first question from the audience concerned a second season of Attack on Titan. Studio WIT didn’t confirm anything, but what they said made it sound like there is a strong possibility we will be seeing more Attack on Titan anime in the future.